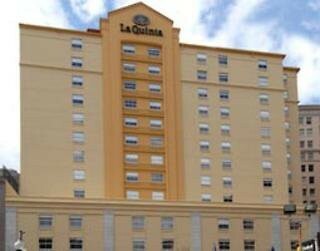 LocationThe hotel is located just minutes from many of the area's attractions and festivals, including the Louisiana Superdome, the Jazz and Heritage Festival, the Port of New Orleans and the Lafayette Square. It is only six blocks from the Ernest N Morial Convention Center and three blocks from the French Quarter.FacilitiesThe hotel features 166 accommodation units. Guests of the hotel are welcomed in the lobby, which has a 24-hour reception and a 24-hour check-out service. Lift access is provided to the upper floors. Services and facilities at the hotel include internet access and a laundry. Guests arriving in their own vehicles can park in the car park for a fee.RoomsAll rooms feature air conditioning, central heating and a bathroom. Bathrooms with wheelchair access can also be booked. Each accommodation unit features a double bed or a king-size bed. Extra beds can be requested. The accommodation units offer a range of amenities, including tea and coffee making equipment. An ironing set is also available to guests. Each accommodation unit offers internet access, a telephone and a TV. Wheelchair-accessible rooms are also bookable. Each of the bathrooms features a shower, a bathtub and a hairdryer.Sports/EntertainmentGuests have plenty of recreational options, with a range of sport and leisure opportunities. The hotel offers an outdoor pool. Sun loungers on the sun terrace offer an inviting place to relax. Leisure options available to guests include a gym. MealsBreakfast is bookable as a board option.PaymentAll major credit cards, including American Express, VISA and MasterCard, are accepted for payment.